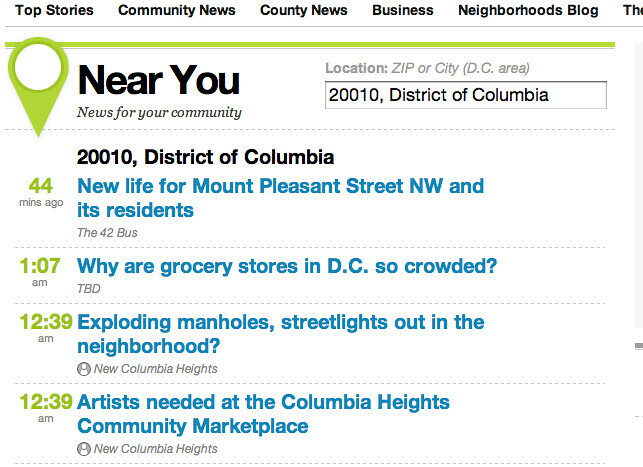 At 428 am in Washington DC a new news site, TBD.com, launched, and it is definitely one worth watching. Why? They have assembled an all-star staff, brimming with passion. The general manager for the project is Jim Brady, the former executive editor and vice president of Washington Post Newsweek interactive. Steve Buttry, the site’s head of community engagement, has a long history in traditional journalism, training and innovation. (For any journalist struggling to come to terms with the unrequited love you feel for the business, read this post by Mimi Johnson, Steve’s wife, as he left the newspaper business to go all digital at TBD.) They have some great staff who I have ‘met’ via Twitter including networked journalists Daniel Victor and Jeff Sonderman. developing ways to work with bloggers and users to generate, share and discuss content. Our goal is to build an online news site for the DC metro area, and do it taking full advantage of the how the web works — with partnership not competition, users not readers, conversation not dictation, linking not duplicating. If you look on Twitter this morning, Jeff and Steve are very busy on their first full day as hosts for the new news service. The site is clean and clear, easy to navigate with a lot of excellent touches. TBD.com launched with an Android app and are awaiting approval for their iPhone application. They zip (post) code news filter to find out content not only from TBD but also from bloggers in the area is excellent. I lived in Washington from 1998 until 2005 as the Washington correspondent of BBCNews.com. I know the city well. I typed in my old home zip code, 20010, and got news about Mount Pleasant including from a blog called The 42 Bus, which was the bus that I used to take to work everyday. Their live traffic information is template for how city sites should add value for such bread and butter news. You can quickly pull up a map showing traffic choke points in the area. They even have a tool to plot your best travel route. The traffic tools are pulled from existing services, but the value is in the package. Wow. Personally, I think that this is smart. With resources declining at most news organisations, they have to be much more strategic about how they use their staff. They need to focus on what value that they add. Jeff Jarvis says: “Cover what you do best and link to the rest“, and this is one of the highest profile tests of that strategy. 7) It’s got a big established sales force to get it going. Both TV stations salespeople with accounts — and relationships. So TBD is an extension of that sales activity, not a start-up ad sell, which bedevils many other start-ups. The other thing that TBD.com has going for it is that it has the commitment of someone who already has seen some success with new models, Robert Allbritton. A few years ago, he launched Politico.com, bringing in two high profile veterans from the Washington Post to compete not only with their newspaper but also specialist political outlets like Roll Call. Politico has managed to create a successful print-web product, “not profitable every quarter but says it’s turning a profit for any given six months,” Allbritton told paidContent.org. What is more important though is his commitment to his ventures. He’s got the money and commitment to support projects past the short term. The other project that I’m watching is John Paton’s Ben Franklin Project at the Journal Register Company. What is it? The Journal Register Company’s Ben Franklin Project is an opportunity to re-imagine the newsgathering process with the focus on Digital First and Print Last. Using only free tools found on the Internet, the project will – from assigning to editing- create, publish and distribute news content on both the web and in print. Succinctly, this company is looking to disrupt its own business. Instead of attacking costs by cutting more staff, they are looking to cut costs by eliminating the price of their own production using free tools. It’s not something that every organisation could do, but with 18 daily newspapers and 150 non-daily local publications, it shows the ambition of their project. This is not a tiny organisation. In practice, the organisation set the goal for all 18 of its newspapers to publish online and in print using free online and free open-source tools, such as the Scribus desktop publishing application. They are also pursuing the same kind of community engagement, networked journalism strategy that is at the heart of TBD.com. Today — July 4, 2010 — marks not only Journal Register Company’s independence from the costly proprietary systems that have long restricted newspapers and news companies alike. Today also marks the start of a revolution. Today marks the beginning of a new path for media companies whose employees are willing to shape their own future. Our goal is to pay out an extra week’s pay this year to all employees for hitting our annual target of $40 Million. That is an amazing investment in journalists and an incentive for them to embrace the disruptive change he is advocating, but it’s so heartening to see journalists engaged and benefitting from change in the industry. With all the talk about innovation in journalism, it is rare to see projects launch with such clear ambitions. After a lot of talk in the industry, we’ll now see what is possible. FlowingData highlighted this data project from WallStats showing how US tax money was spent. The US government being the sprawling beast that it is has an incredibly complex budget, and this visualisation not only makes it accessible but pulls the reader into exploring it. It has to be good. It even had the American queen of home decorating and entertaining, Martha Stewart, talking about it. I also love is that by using Zoomorama, they have leveraged a printed poster online, simply but quite effectively. David Ardia, on legal liability for comments online from Nieman Journalism Lab on Vimeo. David Ardia, director of the Citizen Media Law Project at Harvard, talks about CDA 230, the section of the Communications Decency Act that provides some protection to people who run web sites. That’s not true, and hasn’t been true since 1996.